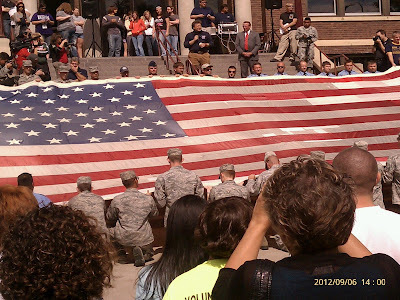 I had the chance to view and hold the National 911 Flag this afternoon at Minot State University. What an amazing story behind this flag. It has been stated that it is the Star Spangled Banner of our generation and I couldn't help but feel a lot of emotion as we stood on the stairs of Ann Nicole Nelson Hall and sang God Bless America. If you haven't heard the stories behind this national treasure, I encourage you to visit their website at http://national911flag.org/. What an honor to have it in Minot today!